Phillies’ Jerad Eickhoff has proved the effectiveness of his slider. One month ago, Jerad Eickhoff was in a rut. It wasn’t that he was pitching badly, but more that his starts lacked inspiration. The results were bland, though not terrible. Eickhoff did have one bad start in April, surrendering seven runs to the Brewers in 5 1/3 innings, but he pitched mostly like a backend starter, regularly achieving, but rarely surpassing, the relatively light requirements for a quality start. For some pitchers, that might not be a problem. In fact, it could be an accomplishment. That’s not the case for Eickhoff, though. After an impressive 51-inning stint with the Phillies last season, the 24-year-old entered this season with lofty hopes. The Phillies weren’t, and still aren’t, going to compete for a playoff spot. This season would be considered a success for them if their young players, Eickhoff included, took the necessary steps to position them as key parts of the future in Philadelphia. One month ago, Eickhoff wasn’t doing that. Eickhoff’s season started to take a turn back to the positive in his May 22 start against the Braves. For the first time since April 18, he completed seven innings, keeping the Braves scoreless while allowing five hits and striking out three. He hit a tiny speed bump against the mighty Cubs in his next start, but has been dominant since then. In three June outings—against the Brewers, Cubs and Blue Jays—Eickhoff has surrendered three earned runs on 13 hits in 19 2/3 innings, striking out 17 batters. Eickhoff again looks like he’s setting himself up to be one of the top three pitchers in the Phillies’ rotation for years to come. • Adam Duvall’s power is legitimate, but is he worth a fantasy roster spot? An interesting trend has developed with respect to Eickhoff’s pitch usage over his last four starts. Eickhoff threw his slider just 8.8% of the time in his first nine starts of the season, which takes us up to the start of our timeline in question. That was a bit of a surprise, given that hitters managed just a .091 batting average against the offering with zero extra-base hits, and that it had a 16.7% whiff rate. That seems like the kind of pitch Eickhoff would want to feature. That’s exactly what he has done in his last four trips to the mound. 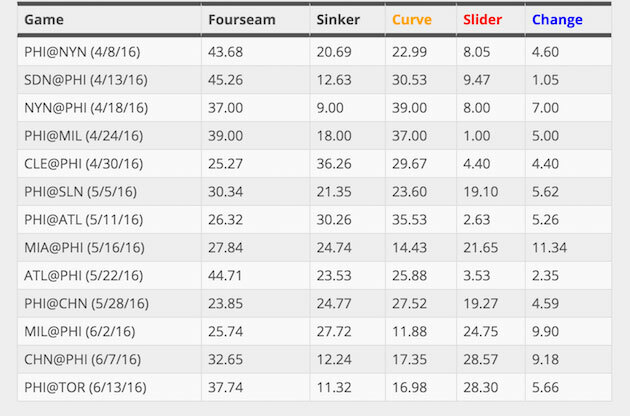 During that time, Eickhoff’s slider usage rate is at 25.1%, more than every pitch in his arsenal, other than his four-seam fastball. Even when you break it down by start, you find the Eickhoff is trusting the slider more and more. Below is Eickhoff’s usage rate by start for all of his pitches. Eickhoff’s slider has been just as good as a primary pitch as it was when he was using it sparingly. Opposing batters are hitting just .105 against the slider. They still don’t have an extra-base hit against it, and have struck out seven times while walking just once when it was the final pitch of a plate appearance. Eickhoff has a 23.1% whiff rate with the pitch in his last four starts, increasing his season-long whiff rate with it to 20.5%. It’s time for us to take a look at Eickhoff’s slider in action. We’ll start by simply setting the scene, with help from Miguel Montero and Addison Russell. The most striking thing about these two sliders is the handedness of the batters. Eickhoff spots it as a backdoor offering to Montero for strike three, and then uses it in a more traditional sweeping manner against Russell, a same-sider, to get the striekout. Every pitch in a repertoire has direct and indirect effects. We spend more time talking about the former, what a pitcher is able to do specifically with that pitch. The latter, however, is just as important. When a pitcher has success with one certain offering, as Eickhoff has recently with his slider, it’s going to open doors to attack with his other pitches. If the pitch is good enough, the pitcher might be able to use his the other elements of his arsenal in unpredictable ways. With that in mind, let’s take a look at Eickhoff’s first matchup with Jose Bautista from his start against the Blue Jays on Monday. We’ll start with the count at 1–1. Eickhoff started Bautista with a fastball, which he fouled off. He then took a fastball off the plate for ball one. Eickhoff comes back with a good slider that’s just off the plate, but Bautista takes it for ball two. Look at how confidently Bautista takes that pitch. He undoubtedly identified it on its way to the plate, but you don’t identify that tight a slider that quickly without a good scouting report. The word on Eickhoff’s slider, both its effectiveness and increased usage, is getting around. Bautista shows us that by how calmly he takes this pitch. Pitching 101 would call for a fastball at 2–1, especially given the circumstances. No pitcher wants to go to 3–1 against the game’s first batter, especially when that first batter is Bautista on top of the potent Toronto lineup. Plus, do you really want to double up on the slider? Yes, in fact, Eickhoff does. We just saw Bautista take a better slider one pitch before this. That’s the surest sign that Eickhoff has him fooled. This is a slider that Bautista does not expect. It’s clear that he’s sitting fastball, and thinks that what he gets as he starts to swing. When he finally realizes what the pitch is, it’s too late for him to hold up. Eickhoff has evened the count at 2–2. Eickhoff goes back to the fastball, a wonderfully spotted pitch on the outside corner that Bautista fouls off to keep the count at 2–2. Go back to Pitching 101, and you’ll find a professor suggesting a slider here. You can afford to miss, knowing that you can come back with a fastball in a full count. On top of that, you’ve already gotten Bautista to flail at one slider, albeit in a fastball count. The slider is the conventional, low-risk pitch in this count. Another reason why a slider would seem the obvious choice is the batter at the plate. Bautista isn’t really a guy you attack with fastballs. 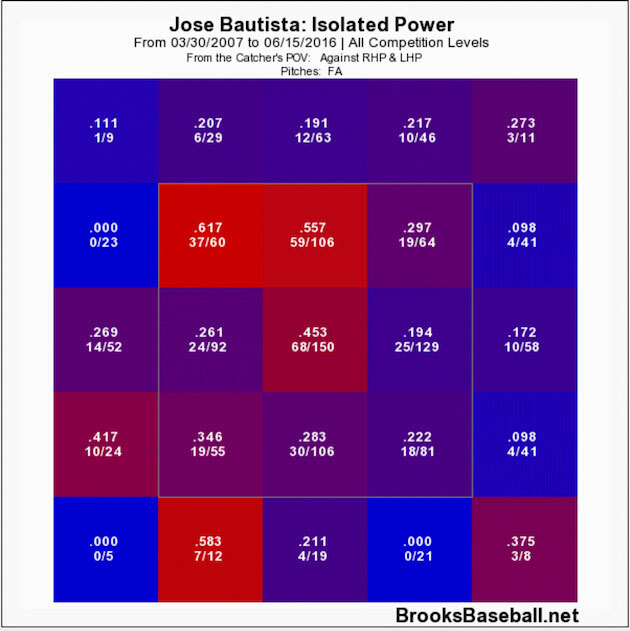 The following is Bautista’s isolated slugging percentage by zone against four-seam fastballs this year. That’s awfully good, especially on the inside corner. Any fastball, especially one inside would seem an unnecessary risk. At the same time, that might be what Bautista is thinking. When you’re potentially facing a slider as good as Eickhoff’s, you’d likely expect it in a 2–2 count. A note to Bautista, and all batters across the league: Eickhoff’s fastball is pretty good, too. There’s the indirect effect of the slider, showing up in a big way. It isn’t easy to fool Bautista with an inside fastball. That’s exactly what Eickhoff did here, and while we can’t get in Bautista’s head, it’s a safe bet that he was guessing slider in this situation. Now that Eickhoff has implanted that thought in the heads of opposing hitters, he can open up his entire repertoire in nearly all counts and against all batters. We would be remiss if we didn’t show you Eickhoff’s best slider from his last four starts. It came in that same outing against the Blue Jays, the one in which he tossed six shutout innings, allowing three hits while striking out five batters. One of those five strikeouts was with the slider against Kevin Pillar. And scene. Eickhoff’s slider has been this good all season. He’s finally trusting it and using the pitch as the weapon that it is.